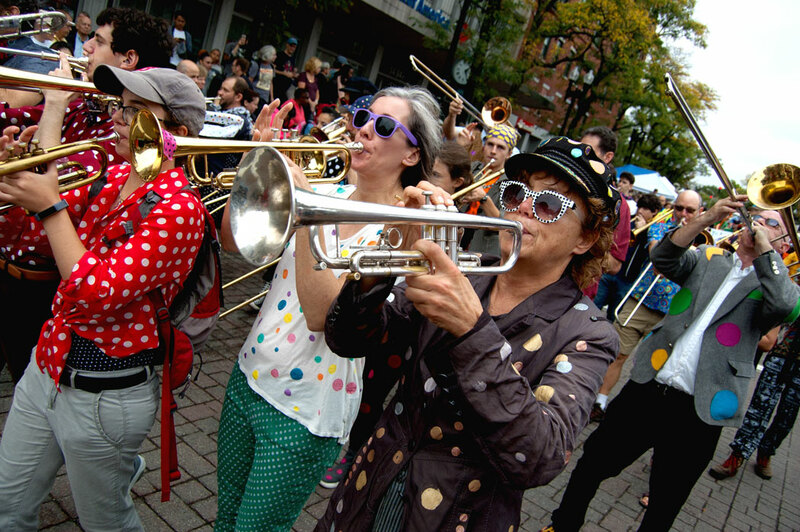 The 13th annual Honk—the infectious street party and festival of activist bands—arrives in Somerville and Cambridge this weekend, featuring an international roster of more than 28 bands. The free outdoor music festival and parade is the rare Boston area cultural invention that’s so amazing and successful that it’s been copycatted in New York, Seattle, Providence, Austin, Detroit, Australia and Brazil. 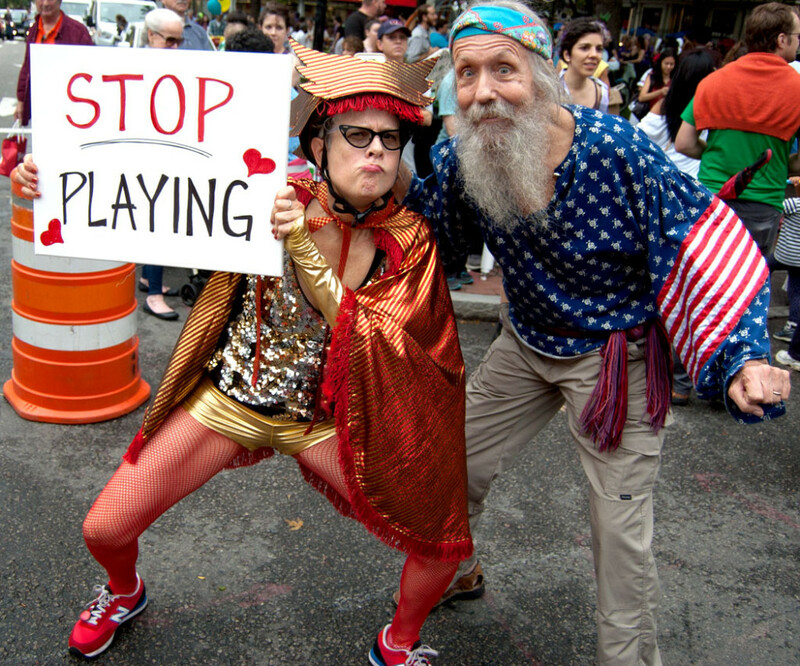 I’ve been going to Honk for 12 years and am friends with many folks involved in the shindig. (My sweetheart illustrated the poster and T-shirts for Honk this year.) So what follows is my well-informed/totally-biased guide to Honk—including some recommended bands, a schedule and good places to hear the music and see the parade. • Come ready to dance. • Part of the pleasure it exploring all the music and discovering new bands. But if you’re choosey about music, try previewing the bands on YouTube. • Emperor Norton’s Stationary Marching Band from Somerville: A klezmer-circus-funk ensemble sporting steampunk outfits. • Environmental Encroachment from Chicago: Check out their signature psychedelic critter costumes. Lots of bunny ears. • New Creations Brass Band from New Orleans: Classic second-line band. • Rara Bel Poze from Boston: Plays rara festival music from Haiti featuring the signature vaccine bamboo tube trumpets and drums. If you’re a rara fan (and you should be) also see Plezi Rara from Brooklyn. • Second Line Social Aid and Pleasure Society Brass Band from Somerville: Members of this New Orleans-style brass band founded Honk. In addition to their hot jazz and their signature red and black attire, you’ll also recognize them from the 2017 Boston Women’s March, the March for Science and numerous other protests around here. • Rude Mechanical Orchestra from New York: A 30-member band and dance troupe in green and black that carries activist banners and offers a fierce brass attack. • Unidos do Swing from São Paulo: Mixes traditional jazz music with Brazilian carnival styles. • What Cheer? Brigade from Providence: An 18-member punk brass band that’s played with everyone from Dan Deacon to Blondie. 7 to 9:30 p.m. Six bands play live in Union Square, Somerville. 11 p.m. Party at Aeronaut Brewing Company, Somerville. 4:30 p.m. Union United Somerville Canvassing Parade in Union Square, Somerville. The group is aiming to make the public aware of an upcoming public hearing in which the city will consider the transfer of land in Union Square for development. Honk band Forward! Marching Band is scheduled to join them. 6:30 to 8 p.m. Rally and March: Stop Evictions at Dorchester Rooming House at 6 Humphreys Place, Dorchester, Boston. 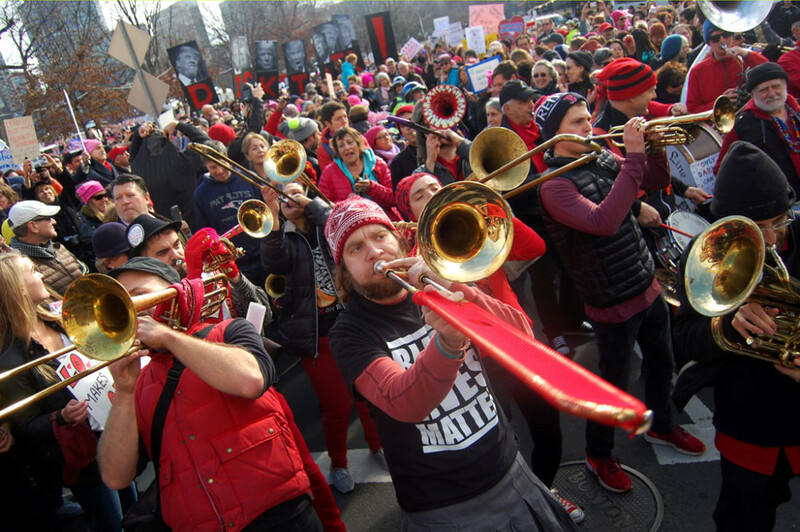 Honk band Unlawful Assembly from St. Paul, Minnesota, is scheduled to take part. 7 p.m. Lantern Parades from Hodgkins Park, Somerville. All are welcome to join in. Arrive early for free lantern-making workshop from 4 to 6 p.m.
8 p.m. Kickoff Showcase at Aeronaut Brewing Company, Somerville. Noon. Opening ceremony at Seven Hills Park, Davis Square, Somerville. 1 to 9 p.m. More than 25 bass bands from around the world play in squares and parks all around Davis Square, Somerville. 1 to 5 p.m. Interactive Area on Elm Street, Somerville. 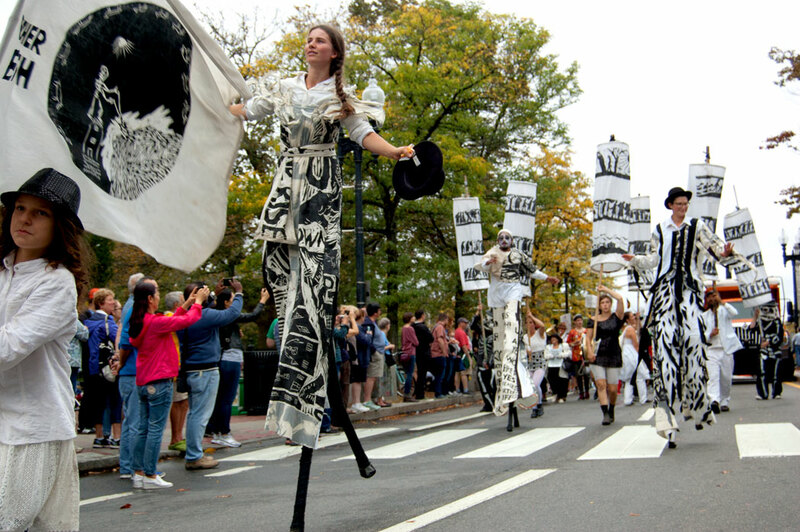 The street will be closed to cars and open for art-making and activism. • If you want to feel the energy of a big crowd and a big bass brand, head to the plazas at Statue Park right outside the Davis Square MBTA stop or in front of VFW Dilboy Hall. • Seven Hills Park offers more of a leafy, picnic on the green vibe. • For a closer, bit more intimate atmosphere see the bands in Davis Square Plaza, the pedestrian alley between Chipotle and Starbucks. • If you’ve got kids, the bands at Kenny Park play right next to a playground where folks can play while you listen. • Note: The crowds get bigger and bigger as the day goes on. Noon to 2 p.m. A monumental parade and spectacle of marching bands, activists, community groups and amazingness (like the legendary Bread and Puppet Theater and the Red Flame Hunters, the first—and perhaps still the only—youth-oriented Mardi Gras Indian tribe in New Orleans) marches from Davis Square, Somerville, to Harvard Square, Cambridge. Route map. 2 to 6 p.m. Bands perform on stage in Harvard Square, Cambridge, as well as nearby at Eliot Triangle, Charlie’s Kitchen, and the Church Street lot. • One of the best spots to watch is the very start of the parade. Find a seat on the curb along Elm Street at Davis Square and watch as the parade comes out of Day Street and heads southeast on Elm Street. If you’ve got kids, hang out at nearby playground at Kenny Park before and/or after. • Massachusetts Avenue at Beach Street just northwest of Porter Square, Cambridge. The parade seems to blossom as bands and groups emerge from the narrow, tree-lined Beech Street and turn onto the wide expanse of Mass. Ave. to head toward Porter Square. • Harvard Square, Cambridge. There are big crowds here, so it can be a bit hard to see, but the street narrows, compacting the energy of the parade as it concludes just south of Harvard Square. And if you’re curious who’s who, announcers on the stage in Harvard Square identify all the parade participants. If you’ve got kids, hang out at the nearby Kemp Playground on Cambridge Common before and/or after. 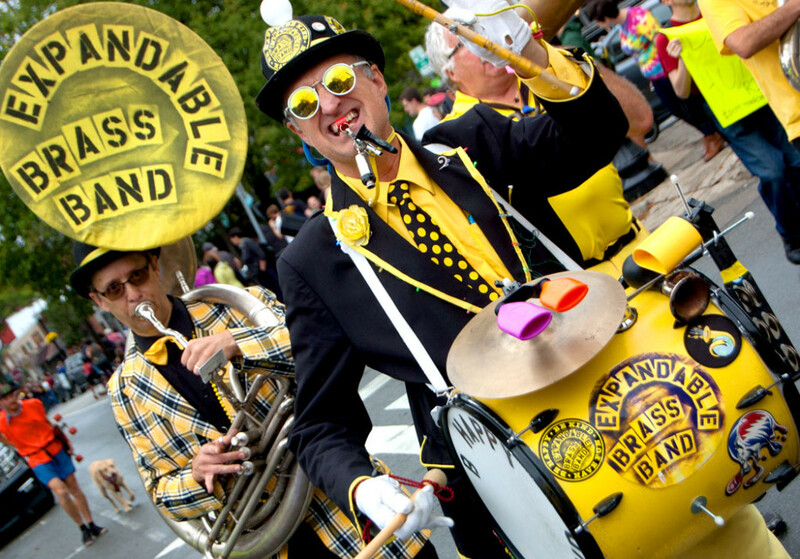 When Honk ends, Pronk, the Providence Honk Festival, begins in Rhode Island. 5 p.m. Parade along South Water Street. 6 to 10 p.m. Bands perform along Providence riverfront near Route 95. 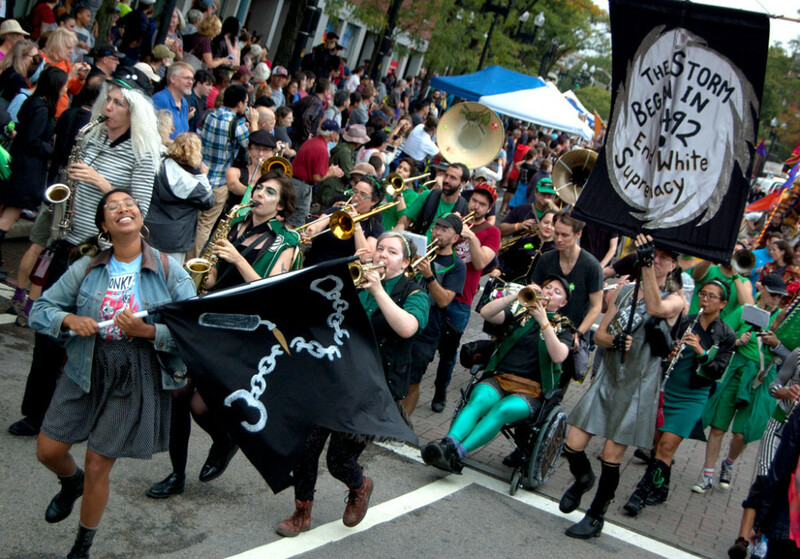 The full list of bands participating in the 2018 Honk fest: aNova Brazil (Somerville, MA), Artesian Rumble Arkestra (Olympia, WA), Band Land Brass Band* (Cambridge, MA), The Brass Balagan (Burlington, VT), The Bread and Puppet Circus Band (Glover, VT), The Carnival Band (Vancouver, BC), Chaotic Insurrection Ensemble (Montréal, QC), Detroit Party Marching Band (Detroit, MI), Dirty Water Brass Band (Boston, MA), Emperor Norton’s Stationary Marching Band (Somerville, MA), Environmental Encroachment (Chicago, IL), Extraordinary Rendition Band (Providence, RI), Forward! Marching Band (Madison, WI), Leftist Marching Band (Portsmouth, NH), Minor Mishap Marching Band (Austin, TX), Musicians Action Group (San Francisco Bay Area, CA), New Creations Brass Band (New Orleans, LA), The Party Band (Lowell, MA), Plezi Rara (Brooklyn, NY), Rara Bel Poze (Boston, MA), Red Flame Hunters (New Orleans, LA), Rise Up! Action Band (Seattle, WA), Rude Mechanical Orchestra (NYC, NY), School of HONK (Somerville, MA), Second Line Social Aid and Pleasure Society (Somerville, MA), Unidos do Swing (São Paulo, Brazil), Unlawful Assembly* (Twin Cities, MN), What Cheer? Brigade (Providence, RI).